San Diego State football team will face a couple of foes it hasn’t seen in a while in the coming season. The Aztecs released their 2019 schedule Monday. San Diego State will open the season at home against Weber State, a team it hasn’t faced since 1967. Last season, the Wildcats finished 10-3, falling to No. 7 Maine in an FCS quarterfinal game. This will be the third meeting between the two programs. The very next week, the Aztecs will face off against the UCLA Bruins in Pasadena at the Rose Bowl. SDSU used to play UCLA on the regular until 1994. Since then, they’ve only squared off five times with the last meeting in 2009. The Aztecs have never won against the Bruins. SDSU will close out its regular season Nov. 30 against Brigham Young, a team it has not seen in a while. The two had developed quite a rivalry before BYU left the Mountain West in 2011. 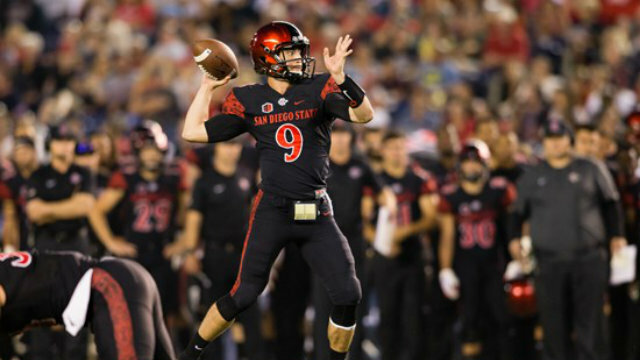 The Aztecs have lost six straight against the Cougars, including the 2012 Poinsettia Bowl — their last meeting. This will be the first time since 2011 SDSU will end its season with a non-conference game. Last season, SDSU flirted with breaking into the top 25 rankings before losing four straight to close out the season. The Aztecs closed out the 2018 season with a 7-6, including a loss to Ohio in the Frisco Bowl. The Aztecs are one of 14 teams to have made a bowl appearance in nine consecutive seasons. * Mountain West Conference games.